Nearly 35 percent of all seafood caught in the United States is caught by marine sport fishermen. 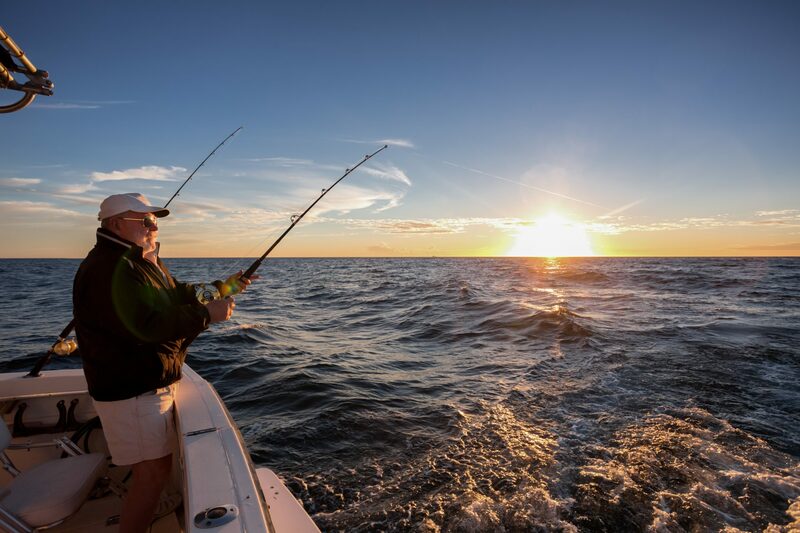 In fact, studies show sport fishermen often seek the same species as commercial fishermen. Most sport fishermen eat what they catch; therefore, preserving the quality of that catch and preventing spoilage are very important. Learn recommendations for proper handling and preservation of popular seafood from the water to the table. Limit trawling time. This will reduce the amount of stress the shrimp are subjected to when dragged over the bottom or too tightly packed in the trawl by other animals caught later in the same tow. After emptying the contents of the trawl, shade the catch if at all possible. 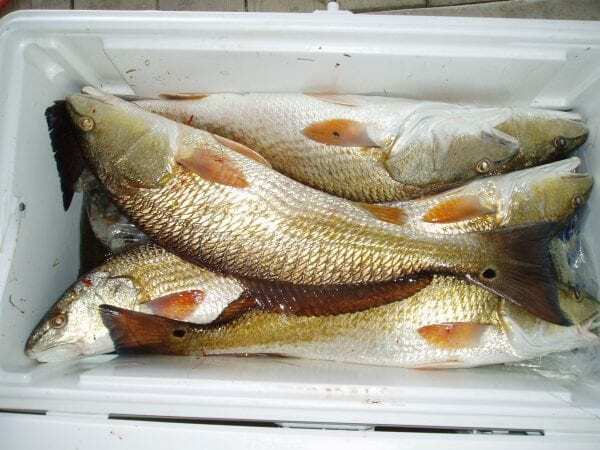 Sort the catch immediately to remove any unwanted by-catch.Insulated plastic coolers with drain plugs are excellent for storing shrimp on board. Place a 3- to 4-inch layer of crushed ice in the bottom of the cooler. This provides a buffer zone to keep shrimp out of direct contact with any shrimp-ice drip which may accumulate in the cooler bottom. 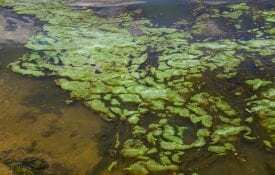 Most of the bacteria collect there. Above the bottom ice layer, mix at least one pound of ice with each pound of shrimp. Mixing is better than layering. Leave the cooler drain plug open or periodically tip the cooler on its side to pour out excess shrimp-ice drip. Wash and sanitize your hands, the kitchen sink, counter top, and any other surfaces which will come in contact with the shrimp. Dissolve 2 tablespoonfuls of liquid laundry bleach in 1 gallon of tap water for a simple, yet effective, sanitizing solution. Thoroughly wash the shrimp using plenty of cool tap water. Head shrimp promptly. Heading reduces the amount of ice and storage space required because the head accounts for 35 to 40 percent of the shrimp’s body weight. Shrimp heads also contain over 80 percent of the spoilage bacteria found in shrimp. Therefore, headed shrimp are less likely to spoil than those with heads. Leave the shells on shrimp tail meat because they help reduce drying out (freezer burn) during frozen storage. If you want to eat the shrimp fresh, mix them with ice and store in the refrigerator. Uncooked shrimp should not be kept on ice in the refrigerator for more than 3 to 4 days. Place 1 pound of shrimp in a 1-quart zip- top freezer bag. Fill bag with cool tap water. Lay bag on its side and drain water until bag is almost flattened against shrimp. Quickly zip bag shut and freeze. Thoroughly wash and sanitize milk cartons using the sanitizing solution described above. Place two pounds of shrimp in a half-gallon waxed milk carton. Fill with cool tap water to within one inch of top. Fold top over, and freeze. After the contents have frozen, open the carton and add more water to cover any exposed shrimp. Then, fold top over again, tape closed, and freeze. Shrimp frozen by these methods will keep for 4 to 6 months. Keep them solidly frozen. Do not thaw and refreeze. Repeated freezing and thawing reduce shrimp quality and provide a potential for spoilage. Thaw shrimp carefully, either overnight in the refrigerator or under cold, running tap water, immediately before use. Blue crabs should be placed in a bucket, pail, or tub after landing. Do not add water or ice because the crabs will soon suffocate. The blue crab carries enough water internally to keep its gills moistened and can survive out of water for a number of hours. Partially cover the holding container with a piece of wood or cardboard and place in the shade. 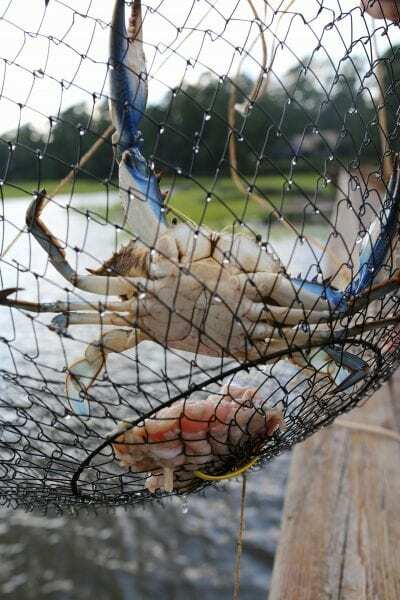 Do not feed captive blue crabs because this fouls the environment in the bucket or pail and may cause the crabs to die. 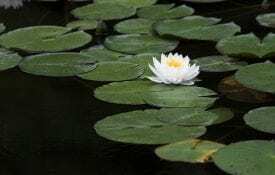 Extended periods out of the water will cause many of these normally active creatures to slow their movements and some to die. Gently tap on the top shell with a stick or utensil to check for life in motionless crabs. Live crabs will respond by quickly raising their claws upward. Dead crabs should be immediately discarded. Wash crabs thoroughly with plenty of cool tap water. This is best done with a kitchen sink sprayer or garden hose. Continue spraying the crabs until water which drains from the holding container is clear and free of any visible trash or murkiness. Crabs to be frozen keep better if they are cooked first. Bring seasoned water to a boil in a large pot or kettle. Add washed live crabs and cover tightly. After water resumes boiling, cook the crabs at a full, rolling boil for at least 15 minutes. Remove from heat, drain, and allow to cool. Wash and sanitize your hands, all work areas, and storage containers with the solution described on page 2. Remove crab claws and either set them aside for storage or crack them open and remove the meat. Remove the spongy, yellowish-orange structures (digestive and reproductive organs) from the body cavity and discard. Also, remove and discard the greyish-white, feathery structures (gills) found on either side of the body cavity. What remains is the cartilaginous body pod which contains the edible white meat. If you plan to eat the crab meat fresh, pick it from the claws and body pod and place in a cleaned and sanitized plastic storage container. Or, the claws and body pods themselves may be placed in plastic storage bags. The packaged pods or picked meat may be stored on ice in the refrigerator for 2 to 3 days. If the crab meat is to be frozen, it is better to leave it in the claws and body pods. Picked crab meat is more easily damaged by ice crystal formation and freezer burn. Place body pods and claws in half-gallon waxed milk cartons which have been cleaned and sanitized with the solution described on page 2. Add cool tap water to within one inch of top. Fold top over, tape closed, and freeze. Blue crab does not hold up very well in the freezer. Crabs frozen by this method will keep for only about 1 month. Do not thaw and refreeze. Thaw overnight in the refrigerator only. Thawing under running tap water washes away the flavor. 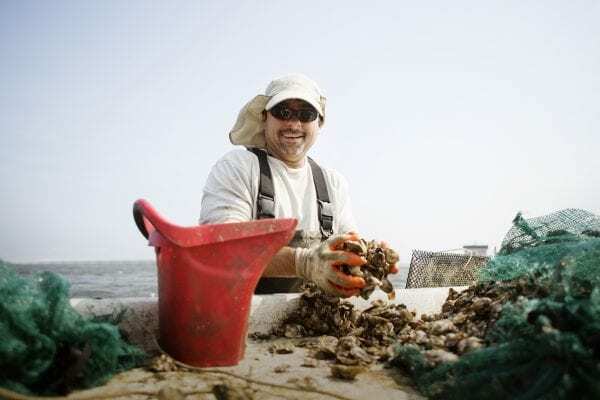 Oysters should be placed in a bucket, pail, or cloth sack after harvesting. Oysters are hearty animals and do not require the addition of water or ice. Place them in some shade if possible. However, get them home by the end of the day. Thoroughly wash and scrub all mud and debris away from the shells. This is best done with a garden hose and scrub brush. Make sure that the oysters are alive. Live oysters hold their shells tightly closed. Tap any oysters with slightly opened or “gaped” shells. Live oysters will tightly close their shells. Discard any dead oysters. Oysters to be eaten fresh may be stored in the refrigerator by either of two methods. Unshucked oysters which are stored without ice in the refrigerator should remain alive for 7 to 10 days. 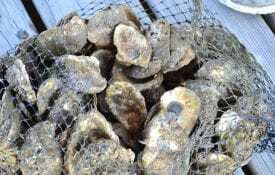 Shucked oyster meats may be placed in sanitized 1-cup or 1-pint containers or plastic bags. These plastic containers or bags should be packed in ice and placed in the refrigerator. Oysters stored by this method will keep for 7 to 10 days. Oysters may also be frozen, but their quality will be somewhat reduced when compared to fresh oysters. The simplest way is to freeze oysters in the shell. Place the oysters in a plastic bag and press out excess air. Seal the bag and freeze. The shell and juices provide an excellent, natural container for the oyster meat. Shucked oyster meats can also be frozen. They will maintain a better flavor if frozen in their own natural juices, called liquor. Place shucked oyster meats in sanitized plastic containers or bags. Press bags flat. Leave 1/2-inch of headspace in containers. Freeze as quickly as possible. Oysters frozen by either of these methods will keep for 2 to 3 months. Do not thaw and refreeze. Thaw overnight in refrigerator only. Thawing under running water washes away the flavor. Insulated plastic coolers with drain plugs are excellent for shipboard or dockside storage of fish. Place a 3- to 4-inch layer of crushed ice in the bottom of the cooler. This provides a buffer zone to keep fish out of direct contact with any fish-ice drip which may accumulate in the cooler bottom. Most of the bacteria collect there. Ice fish as quickly as possible after landing. Most small or medium-sized fish do not require cleaning or dressing before icing. Simply mix at least 1 pound of ice with each pound of fish. Larger fish such as king mackerel, cobia (ling), or bull redfish (adult red drum), should be headed and gutted. Fill the body cavity with ice, and pack the fish in ice. Bloody fish, like amberjack, tuna, or bonito (little tunny), should be bled immediately by making an incision at the base of the tail. Pack in ice. Wash and sanitize your hands, all work areas, and storage containers with the solution described above. Every fisherman has a favorite way of dressing each species he catches. Before preserving your fish, dress it to the form that suits your needs, whether simple pan-dressing (heading, gutting, scaling), filleting, or steaking. Rinse dressed fish or fillets thoroughly under plenty of cool, running tap water. Many large fish can have tapeworms, which are usually found in the tail quarter of the fish. To remove them, fillet the fish in the usual fashion. The affected area will have a reddish tinge, unlike the whitish, unaffected areas. The tapeworms themselves are white. Although there should be no danger from eating this portion of the fish, most people will probably want to remove and discard the affected section. If you plan to eat your fish fresh, wrap it in clear plastic or place it in zip-top storage bags. Pack in ice and place in the refrigerator. Fresh fish stored in this manner will keep for 5 to 7 days. Follow the directions for freezing shrimp. Dip each fish portion or fillet in ice water. Lay on a cookie sheet (not touching) and place in freezer. After the fish are solidly frozen, dip them in ice water again, place them back on the cookie sheet, and return to freezer. Repeat Step B several times until ice glaze completely covers fish. Wrap glazed fish in two layers of plastic wrap or seal in plastic bags. Most fish frozen by these methods will keep for 4 to 6 months. However, fish with high fat contents, such as mackerel, mullet, or bluefish, maintain their quality while frozen for about 3 months only. Keep fish solidly frozen. Do not thaw and refreeze. Repeated thawing and refreezing reduce quality and provide a potential for spoilage. Thaw fish carefully, either overnight in the refrigerator or under cold, running tap water immediately before use. Appreciation is expressed to the following for their assistance in reviewing the manuscript for this publication: Paul Comar, Andy DePaola, and Steve Heath.